Another day, another gig, another country. Melbourne-based Irish singer-songwriter Andy White has taken memories and notes from a decade’s touring adventures and presented them as a memoir in his book, 21st Century Troubadour (Langan Press, Belfast, 2009). The book is neatly split into sections that cover various tours in chronological order, tracking White’s relentless wanderlust as he visits mainland Europe, the USA & Canada, Japan, Australia, England, Scotland and Ireland. This is the life of a performing musician, described by White with disarming charm, but at the same time he pulls no punches. He comes across as a fair-minded and decent bloke, but he’s no mug. I get the feeling that the pros outweigh the cons, but the tales of rubbish venues, dodgy promoters and the boring, soulless tedium of international air travel are relayed with such skill that the reader can’t help but share in the pain. Having said that, this is a read that will cause a lot more smiles than frowns. Readers will learn why it is important to change t-shirts between every set when performing in Japan, why The Bag is of critical importance to the touring musician, and how to get through a performance when the bulk of the audience is seemingly more interested in the football showing on the big screen. There’s a lovely recollection of this lonesome traveller’s trip out to Lowell, to visit the quiet, peaceful grave of the influential Jack Kerouac. Friendships are made and maintained across the globe, without which the world of the travelling performer would be a much lonelier place. Adventures with fellow musicians are recanted, and there are many other tales of major and minor characters, brought to life with precision and, more often than not, affection. 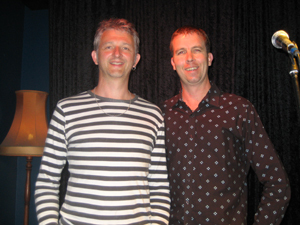 And, of course, there are loads of stories from the hundreds of gigs that White has played - here, there and everywhere. Whether discussing the good, the bad or the out-of-tune, White’s writing is easygoing, entertaining and insightful in equal measure. There’s an understated gravitas accompanying these boy’s own tales of life on the road, which give an insight into White’s character; into the things he counts as important. White’s reflections on this working life, and indeed of life itself, are a joy to read, whether the reader is a musician or not. There’s a great deal to be had from this book. 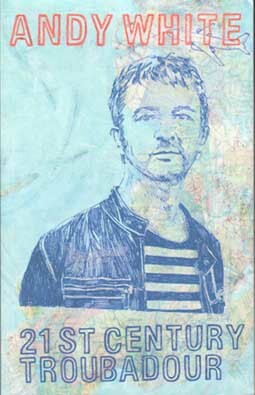 Copies of 21st Century Troubadour can be sourced from the author’s website at http://www.andywhite.com. Drop a line to the ever-helpful Rose (rose@andywhite.com) if you’d like more information.